Do You Remember the Levee Line in Downtown St. Louis? The #99 Downtown Trolley is not the only downtown circulator bus that has traveled St. Louis’ downtown streets. Remember the Levee Line? Decked out in a riverboat-inspired design (complete with smokestack) the Levee Line operated in the late 1980s, traveling down Lenore K. Sullivan Boulevard, through Laclede’s Landing, up Washington Avenue, looping around 9th Street and Broadway, and rolling up Market Street to Union Station. The Levee Line served the downtown area and was popular for tourism and conventions. The Levee Line’s riverboat theme was not just a nod to St. Louis’ celebrated steamboat history. In the late 1980s, the Mississippi Riverfront still was home to several riverboats, including: the kids’ favorite Riverboat McDonald’s; the President Casino; the stalwart of nightlife, the Admiral; and the Towboat Museum. If you grew up in the St. Louis area during that time, chances are you went on a field trip to the Riverfront, with visits to the Arch and one of more of the riverboats. And maybe you remember taking a ride on the Levee Line. Do you remember the Levee Line? Are there are other special Bi-State services that you used to take? The Levee Line was the stuff! 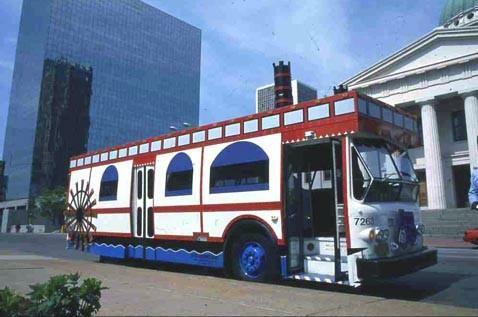 I also remember the GUS Bus (Galleria-Union Station). That was a real plush express commuter bus that was discontinued when Bi-State morphed into Metro. There also used to be a downtown shuttle that used small shuttle-type buses that were really cute, similar to the Scooter bus that Jeff posted. Wow. That my friends is a bus. I’m a transplant to St. Louis, not originally from here. Was this a real city bus run by Bi-State (assuming what I know as the pre-Metro Bi-State was called Bi-State at the time)? Need an edit button. LOL! What I am asking is was this run by a tourist company (like some of the Hop On, Hop Off buses are in other cities) or was this part of the regular transit system? I have a friend who is a St. Louis native. He used to take an “Orbit” bus with his mom around River Roads and Northland in the 70s. The Levee Line ustlized the Rhor Flxible which is seen in the picture. Like RTBones says about the Orbit, I remember that one too. Those were Argosys. Discontinuing those express buses using over-the-road type buses was stupid. I remember when they got rid of those type of buses, on some of the express routes they ran on went down! In Dallas and in Newark, they still use those Greyhound type buses on their express routes. On those over-the-road buses we had that were built by Neoplan, the bus driver would use the lights to pick up and drop off passegers, and when they got on the highway, they would turn the lights off and you got an extrea 20 or 30 minutes rest time on the bus! If we want ridership to really rise like mad and to really get our highways clear, then we need to REALLY deliver to the client! Give the customers EXACTLY what they want. We could have kept the Rhor Flxible and just buy extra Lift-U wheelchair lifts to mount on board. The 8200s we had and their sister buses known as the 8300s were trouble. The seats were all plastic and no safety bar for the back seat passengers to grab onto in the event of an emergency. The motor for the right hand windshield wiper was smaller than the oe of the left.